So as you all may know I am all about Fashion! When I am not busy with school or other activities I am literally 90% of the time thinking about something fashion related (which brings me to this post). So lately I’ve been really into building up my collection of all things accessories. Every time I hit up the mall or head over to a shopping center I’m checking out the accessory section for a cool piece that could be utilized for years to come. The top 4 accessories I’ve been all about are the floppy hat, holographic shoes, sunglasses (especially shades with colored lenses), and clutches. Luckily, so far I currently have two out of my four must have list. I have the floppy hat in black and burgundy (I am also looking to get it in emerald green and brown). I also have a clutch similar to the one displayed in the picture. It is a see-through clutch that comes with a smaller black leather pouch that I snagged from Zara on sale. I literally can’t wait to dress up and wear my new pieces out! 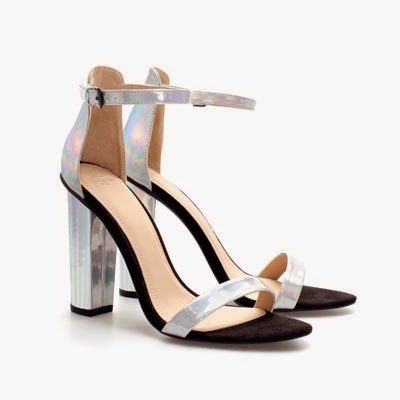 But I have yet to find these Zara Iridescent shoes anywhere! As for the sunnies, I haven’t had a chance to purchase them but I know I will definitely be able to snag a pair from any store. Check out this video below of my friend Melizza and myself giving some tips of what accessories every woman should have. Let me know which accessories you are dying for currently as well! I'm very interested in the new metallic body art. It can be as very elegant, yet casual look. Yes I enjoy the versatility of it as well!